BLT sandwiches are a classic, one that you and I have likely had our fair share of, no doubt. Over the years, I’ve seen the BLT take on many forms, one of which is a favorite of mine, BLT Flatbreads with Avocado Spread (seriously, yum!). I’ve also seen BLT dip, and this recipe for BLT pasta salad is always a hit. With bacon, how can you go wrong?! When I decided I wanted to make a BLT Wrap, I didn’t want it to be ordinary, so I thought about a way I could distinguish it from other BLT options without messing with the key, oh so very important ingredients: bacon, lettuce, and tomato. Typically the BLT has mayo which would be quite boring on a wrap, so I decided to make things more exciting and come up with a sauce, a special sauce, just for these BLT Wraps! Sauces are kind of important, ya know? I mean, what would ribs be without the BBQ sauce? Or veggies without ranch? I didn’t want to mess this up, so I tried several different combinations of ingredients before finally settling on the trio of…. cream cheese, a little mayo, and dijon mustard. It may sound weird, but guess what? It’s delicious! Instead of using a traditional tomato, or even roma tomatoes, I decided to go with quartered grape tomatoes that I seasoned with a little salt and pepper. Perfect! Feel free to use whatever tomatoes you have on hand. And then of course you’ll need some shredded lettuce. Can we talk about the sauce again? Who would have thought that a combination of cream cheese, mayo, and dijon would pair so perfectly with the BLT? 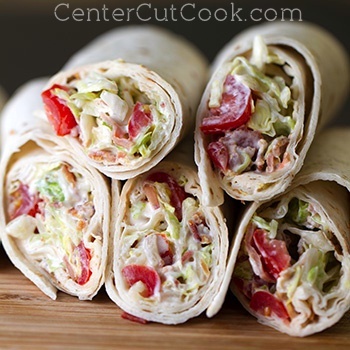 If you don’t have cream cheese or dijon mustard on hand, regular ole mayo will do the trick but the sauce compliments these wraps perfectly. Once you’ve prepped all of the ingredients, you’ll combine them together in a big bowl. Then you’ll scoop about 1/2 cup of filling into each tortilla. I used big burrito sized tortillas and they worked perfectly. Arrange the filling towards the bottom 1/3 of the tortilla, and then roll ’em up really tightly. 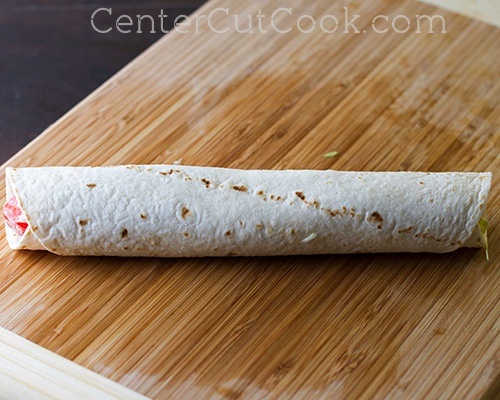 Sort of like you’re making Skinny Creamy Taquitos. 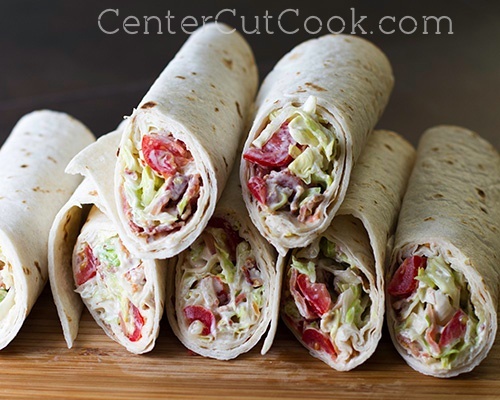 Once they’re rolled up tightly, you’ll cut them in half, on an angle if you want to be fancy. Sometimes I like to be fancy. 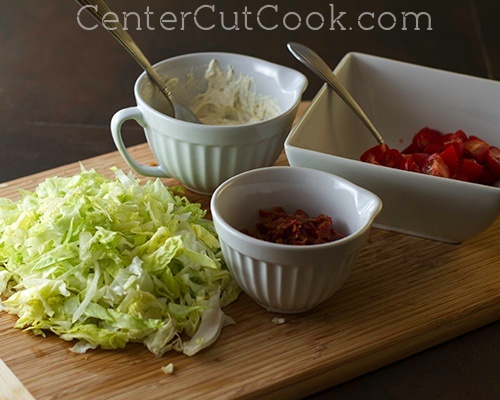 Ta-da….. BLT Wraps! Look how pretty they look! We thoroughly enjoyed these guys! 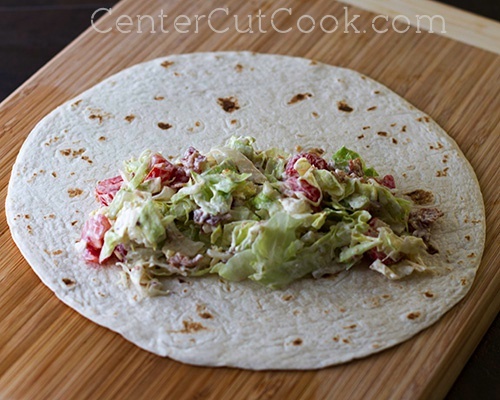 I was able to make 4 burrito sized wraps out of this recipe. I cut each wrap in half so that I ended up with 8 halves. They are best eaten fresh, as the sauce tends to make the rest of the ingredients soggy. They work perfectly for lunch, a snack, or even an appetizer! 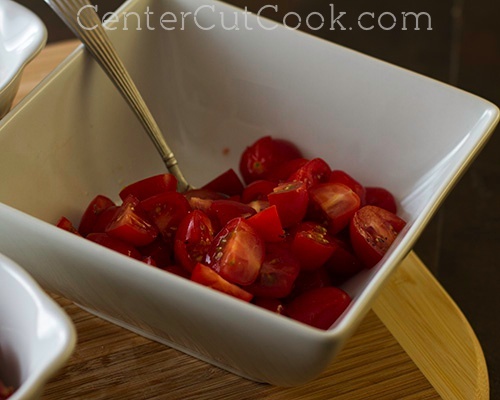 In a small bowl, toss quartered grape tomatoes with a dash of salt and pepper. 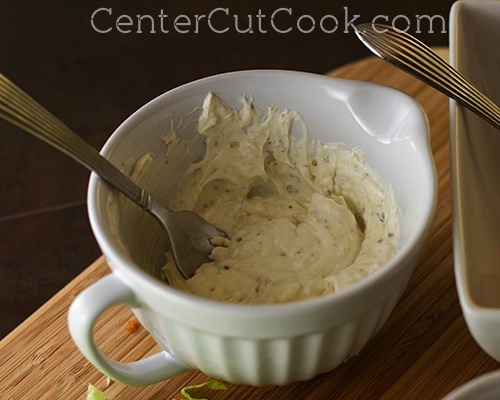 In another small bowl, combine softened cream cheese with mayo and dijon mustard. Mix well. 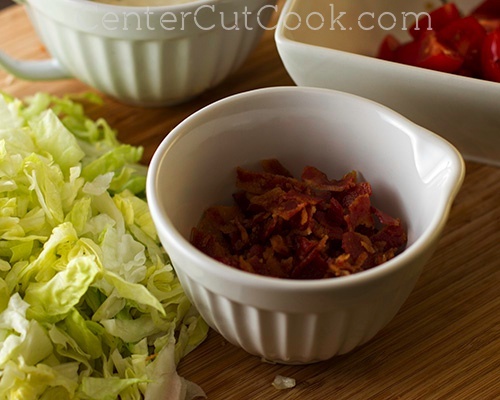 In a large bowl, combine bacon, lettuce, and tomato with the sauce.